One of Darlaston’s once large industries was the manufacture of structural iron and steel work. Many of the country’s important buildings and structures were built using locally made fabrications. Darlaston based company’s including Rubery Owen and E. C. & J. Keay Limited were known throughout much of the world. The industry started in the town in the 1840s in the first large factory in the area; King's Hill Works, that was owned and run by S & R Carter. Sadly the business ended in 1866 because the bank used by the firm, the Birmingham Banking Company, suffered serious liquidity problems and ceased to trade, leaving Carters with many unpaid bills and angry creditors. As a result the factory and contents were sold at auction in June 1867 at the Old Castle Hotel in Pinfold Street. The Darlaston Iron Bridge and Roofing Company Limited was formed on 29th July 1867. The Directors were Richard Mills, Samuel Rubery, and James Slater. John Tunner Rubery became Company Secretary, and Simeon Carter was Works Manager. It is likely that the new company acquired at least part, if not the whole of S & R Carter’s Kings Hill Works to enable work to immediately go ahead on several important orders including the wrought ironwork for the roof of Liverpool Lime Street Station. In 1867 to 1868 the station was lengthened and widened. The northern-most bay of the roof, designed by the London & North Western Railway’s Chief Engineer, William Baker, was built at that time. Seven years later the southern bay, also designed by William Baker was added. The roofs are 645ft long and cover most of the platform area. The north roof was the largest arched, single span wrought iron roof ever built at the time. It took 2,500 tons of iron to build the structure. The spans of the roof vary between 185ft and 215ft, with an average of 212ft. It appears that the Darlaston Iron Bridge and Roofing Company were acting as sub-contractors to G. Thompson & Company, Railway Contractors of Liverpool, who were awarded the original contract. The cylindrical cast iron columns were manufactured by George Forrester & Company, Vauxhall Foundry, Liverpool. The roof was erected by the Darlaston Iron Bridge and Roofing Company under the watchful eye of the company’s Forman of Works, Mr. James Kean. Work was completed in 1871 at a cost of £44,347. Lime Street Station. Courtesy of Peter Carter. The company may also have had a site at Fallings Heath. In J. G. Harrod & Company’s Postal and Commercial Directory of 1870 the company is listed as: Darlaston Iron Bridge and Roofing Company, Limited, Fallings Heath. In 1871 Andrew Shirlaw, a Scottish mechanical engineer became Managing Director of the Darlaston Iron Bridge and Roofing Company, and by August 1872 the nominal capital had been increased to £20,000. The shareholders were: Alexander Brogden M.P. for Ulverston Lancashire; Simeon Carter, Works Manager; Edward Eastwood, Wagon Builder at Chesterfield; Enoch Horton, Nut & Bolt Manufacturer at Darlaston; Anna Wood, of St. John’s Wood, London; Richard Mills; Samuel Rubery; John Tunner Rubery; Samuel Rubery Junior; James Slater; and Andrew Shirlaw. Around 1870 the company moved to a new factory in Station Street, Darlaston, on a site that is roughly opposite to where Salisbury Primary School is today. It was an ideal site lying next to the Darlaston Branch of the London & North Western Railway, giving easy access to much of the country. The branch line opened in 1863. This was one of the first factories in the area, which had previously been extensively mined for coal by Batchcroft Colliery. Other factories soon appeared including Enoch Horton’s New Alma Works which was built next door. An advert from 1872. Courtesy of Peter Carter. In the 1870s the London & North Western Railway quadrupled the West Coast Main Line between Stafford and Crewe to accommodate more rail traffic. Plans for the scheme were drawn-up in 1871 and the contract for new bridges was given to William Moss & Son, contractors and builders, based in Wolverhampton Road, Stafford. In October 1872 William Moss asked for tenders for the ironwork for the bridges, which amounted to around 1,200 tons of wrought iron in main girders and cross girders, bent plates etc. all fixed and painted. The contract for the ironwork was given to the Darlaston Iron Bridge and Roofing Company in November 1872. The company had quoted the following prices per ton: wrought iron bridges - £19, cast iron bridges - £9.10s, and bolts - £24. The total cost of the materials quoted came to £22,589. It was later discovered that an extra bridge which had not been included in the original plans was required. The Darlaston company supplied the ironwork for the bridge at a cost of £319. The project was completed in 1876, but William Moss withheld part of the payment to the company because some cappings on the bridges had not been supplied. This resulted in a court case in the High Court of Justice, in London in 1877. The Darlaston company claimed £2,843 for the capping and the extra bridge, and a full payment totalling £25,632. In June 1872 the company was awarded a contract by the Liverpool Corporation Health Committee for the ironwork for a wrought iron arched bridge to carry Sandhills Lane over the Leeds and Liverpool Canal. The Sandhills Bridge is still in use today. In 1873 Simeon Carter, Works Manager at the Darlaston Iron Bridge and Roofing Company left to start his own business. In 1870 he had purchased some land at James Bridge from James Slater and Richard Mills on which he opened a new factory under the name of Carter, Ford and Company Limited. 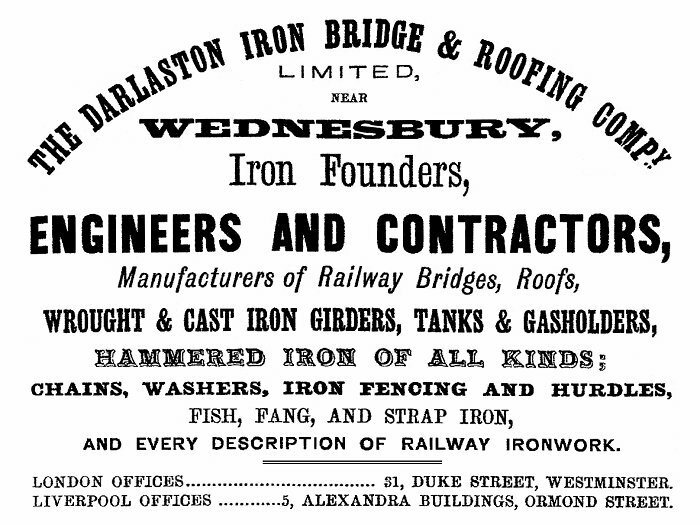 In September 1873 the Darlaston Iron Bridge and Roofing Company became The Bridge and Roofing Company Limited. One of the company’s projects was the construction of Sculcoates Swing Bridge over the river Hull, in Chapman Road, Hull. It was constructed in 1874 and is now Grade II listed. The bridge officially opened in January, 1875. From The Engineer, 2nd April, 1875. We give this week the first of two working drawings of the new bridge at Kingston-upon-Hull, opened to the public by the Mayor and Corporation on the 9th January. The bridge is over the River Hull, and is constructed in two spans of 56ft. and 27ft., the wider span being movable for the purpose of navigation. The appearance of the bridge is light, though at the same time its structure is substantial. The swinging portion of the bridge is formed by two longitudinal plate girders, 113ft. in length, supporting a carriageway between them and footways on cantilevers on each side, and at the tail end of each girder a cast iron counterbalance box of ornamental design is constructed in three compartments, the arms of Hull, encircled with a festoon and riband, being cast in relief on the two end panels of the side elevation. The introduction of a counterbalance box in this manner gives a character to the design, and greatly adds to the symmetrical appearance of the structure, and is, we believe, the first application of this feature to a bridge of this description. The turning machinery is in duplicate, and is fixed in and under the counterbalance box, where it gears into a rack fixed round the circular retaining wall of the bridge pit, and is worked by hand power from the footpaths. The moving load, 240 tons can be opened or closed by four men in two minutes. The motion of the bridge whilst it is being turned is perfectly smooth and without any perceptible vibration. The pier in the centre of the river consists of two cylinders 5ft. 6in. in diameter at the bottom, and 4ft. 3in, at the top, of cast iron, varying from 1⅛in. to 1¼in. in thickness. The method adopted for the sinking of the cylinders was by excavating from the interior and by weighting. They were sunk by this means to a depth of 22ft. below the level of low water of ordinary spring tides, or to about 18ft. below the bed of the river, when a hard dry bed of the boulder clay was reached. After being sunk to within a few inches of the required level, they were filled with cement concrete, and each subsequently weighted with a load of 96 tons, which was kept on until the cylinders remained perfectly stationary for 24 hours, the north cylinder being forced into the clay 1⅛in. during the process, and the south cylinder 1 and 17/32in. ; and it is noteworthy that the actual depth to which they were sunk was within 1 and 1/14in. of each other, so that the uppermost castings, which it is usual to leave off for adjusting any differences in this respect, had only to be varied to that small extent. The strength of the bridge was tested with most satisfactory results with a weight of 50 tons, when the deflection was only ¼in., and it resumed its original level on the weight being removed. 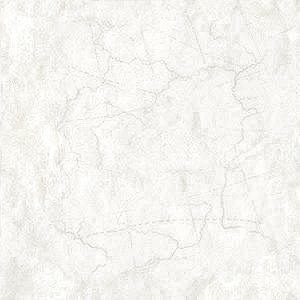 The whole has been erected from the design and under the immediate superintendence of the engineer and surveyor to the local board, Mr. J. 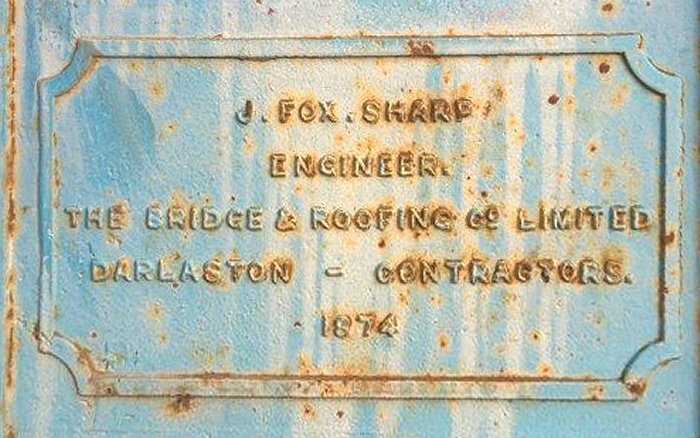 Fox Sharp, C.E. ; the contractors for the ironwork being the Bridge and Roofing Company, Darlaston, and for the masonry, Messrs. Simpson and Malone of Hull. In October 1874 The Bridge and Roofing Company Limited won a contract to build a large road bridge over the Metropolitan Railway at Farringdon Road. The company quoted £18,250 for the work. Other contracts included the Egremont Ferry Pier and the floating approach to the Princes Landing Stage, including the six sets of pontoons that supported the staging. 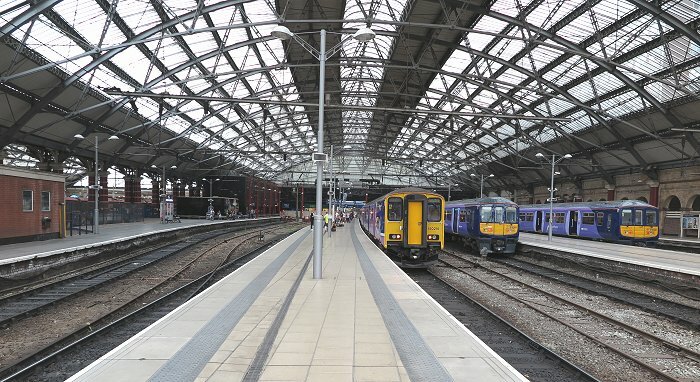 On 15th November 1876 the London & North Western Railway put out for tenders for the construction of a second shed at Liverpool Lime Street Station. The contract was awarded to The Bridge and Roofing Company Limited at a price of £35,840. The roof which had spans varying from 170ft to 195ft was erected by E.W. Ives, Civil Engineer of London. The project was completed in the middle of 1879. In June 1883 The Bridge and Roofing Company were awarded a contract for the building of towpath bridges over the river Soar in Leicester for £849. 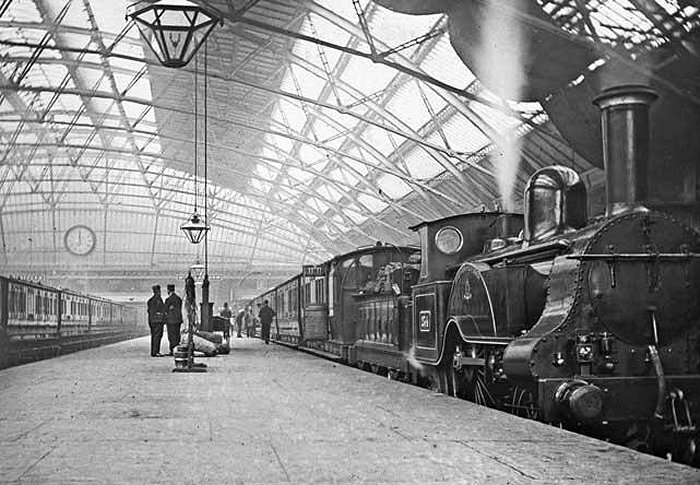 Other projects included the roof of the new Midland Railway station built alongside Birmingham New Street Station, covering 16,000 square yards. One of the sub contractors for ironwork was Horton and Son, Darlaston. In the mid 1880s a growing preference for the use of steel rather than iron led to a reduction in orders and the closure of the company in about 1886. On 25th and 27th of May 1887 much of the company’s machinery etc was sold in a two day sale, held at the factory. The factory was acquired by Horton and Sons in 1891, and the Bridge and Roofing Company Limited was officially dissolved on 21st June, 1892. I have to thank Peter Carter, who supplied much of the information. He has extensively researched his family and their various business ventures.